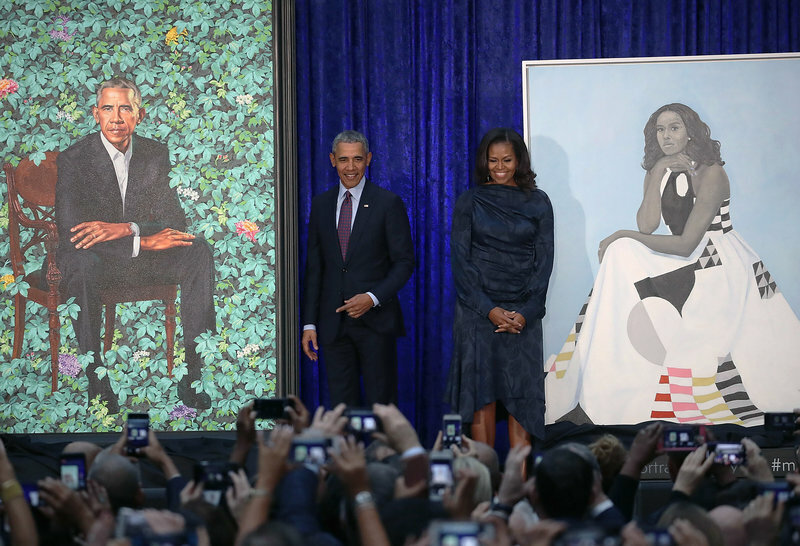 Celebrities from Shonda Rimes to Steven Spielberg, former administration officials from Josh Earnest to Eric Holder, and members of the media filed into the Portrait Gallery’s expansive, glass-covered central courtyard for the ceremony. Kim Sajet, the director of the gallery, told the audience that a portrait was not truly finished until a viewer, a member of the public, had a personal encounter with it. The paintings exemplify the two artists’ trademark styles. But he said he rejected Wiley’s ideas that involved him, for instance, riding a horse. “How do you explain that a lot of that is just simply not true?” Wiley said, when he took to the lectern. Then he got more serious. Sherald, “known for her stylized, archetypal portrayals of African Americans,” survived a heart transplant in 2012, the museum notes. “A personification of resilience herself, Sherald conveys the inner strength of her subjects through a combination of calm expressions and confrontational poses,” the gallery writes. “You exist in our minds and our hearts in the way that you do because we can see ourselves in you,” she said, turning toward Michelle Obama. The gallery’s portrait of Bill Clinton, by Nelson Shanks, was controversial after Shanks said he’d hidden a reference to the Monica Lewinsky scandal in the canvas. A different portrait of Clinton, a Chuck Close painting of the former president’s grin, is on display in the museum. Sherald’s painting of Michelle Obama will be on display through November in the museum’s “Recent Acquisitions” section.